- Little N having a blast at his friend's birthday party at a soft play centre on Saturday. - Catching up with family at my Nana's 75th birthday lunch on Sunday. 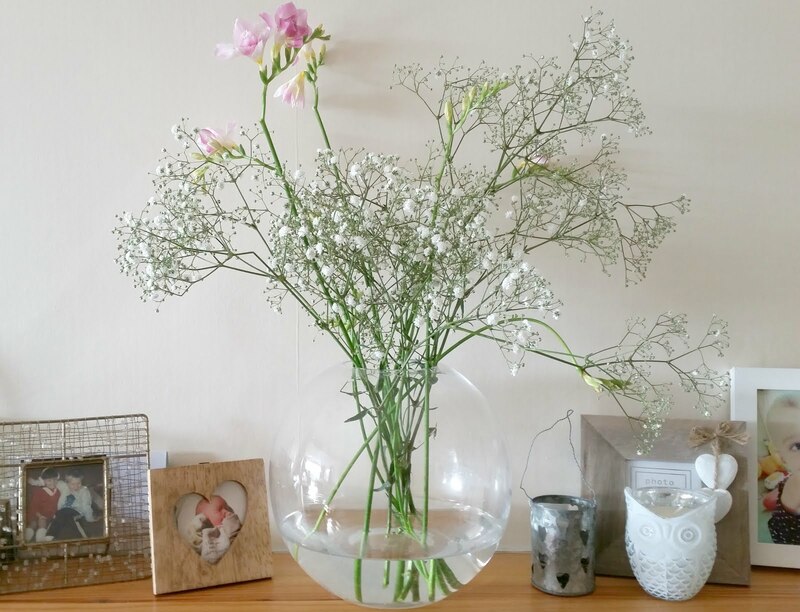 - Picking up a gorgeous bunch of gypsophila, it's so pretty and wintery. The little buds look like tiny snowballs. - Making time for myself to read - I have just finished reading Disclaimer by Renee Knight. It had a bit of a slow start but I was gripped by the end and it has a shocking twist. - Taking the boys to choose some library books, and choosing a book for myself! It's knitting book and I borrowed a magazine as well. - Little N's face when he finally got the vampire Minion in his KinderEgg. I can't tell you how many of these eggs we have got through trying to get this one! - And the thing that has made us all happiest this week is Ian returning home from his work trip to the US! We've all really missed him so it's great to have him home again. Share the linky love by commenting on other posts, and don't forget to comment on mine and Kate's posts, too!